Dubroom In-site, as the name suggests, deal with the runnings of this website itself. Updates, new formats,news and views directly relating to the Dubroom, stuff like this. WWW, July 19 2014 - In the 33rd chapter of Dubroom In-Site, Messian Dread writes about his latest and upcoming musical releases as well as a number of other issues related to the Dubroom website. What can -JAH Willing- be expected, what has been done already, and how's the website doing in general? With an EP scheduled for release tomorrow, a virtual 7 inch and a virtual 12 inch as well as a Dub Album scheduled for release in the coming weeks and with another DUB Album under construction, there's quite a bit of musical output at the Dubroom momentarily. After a couple of years of silence, silence no more! Sometimes, it is good to take a little bit of rest. The Dubroom started back in 1997 and developed but during the first part of 2014 and some years before that, yours truly had absolutely no energy to continue in the same way. The sound that was developed around 2006, was worn out to say the least. Five albums and well over thirty EP's/Singles, altogether about 130 different mixes, the last one released in this year, 2014. In another update you can already read a little bit about it, but this edition of Dubroom In-Site gives a bigger picture. WWW, April 2014 - Those who frequent the Dubroom Message Boards and those who refresh pages they visited before may have noticed that there have been quite some changes on the Dubroom Website. All of this is the result of an enormous renovation project that led to a new look and the removal of all advertizements. Frankly: it was about time. Some parts of the Dubroom website were left untouched for years and had a lay-out which in the meantime you could give the label "ancient". Yes, we are living in an era wherein we can speak about ancient history of the Internet... Enfin, a serious project had to be launched and today (April14, 2014) it's time to announce the completion of it. Let's take a look at the major changes and improvements. WWW, May 2010 - After a big clean-up in the Dubroom's dusty digital corners, we came across none less than 40 wave files, of which only the MP3 versions had been released. There was even a tune which was never released with full lyrics. Featuring Jah Roots, the Dubster Connection and much of Messian Dread's works from 2000 which had previously only been released in the MP3 format. 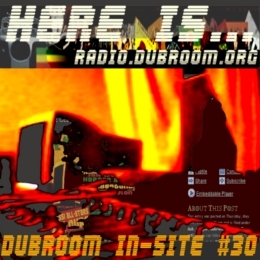 WWW, May 2010 - After what was really a long hiatus of several years, Radio Dubroom is back online, allbeit somewhat different than before. One very nice difference is, that all episodes can be downloaded for free instead of just being streamed. Read about it in the 30th edition of Dubroom In-Site!